Kyleigh Kühn was born and raised in California along with three brothers. The Penny Campaign, an initiative Kuhn started at the age of 16 with her mother and news anchor Cheryl Jennings, was her first philanthropic effort. When Kyleigh was a child the family moved from California to Alaska where Mrs. Kühn worked fulltime, raised four children and started a company called News Link International on the side. Her mother, Heidi, a former CNN journalist and founder of Roots of Peace, used to sing "I Am Woman", the swansong of the feminist movement, to Kyleigh when she was a child, to make her sleep. Kyleigh, who is now 23 years of age, has a degree from Berkeley in Peace and Conflict Studies. She participated in the first summit on the condition of women when she was 8 and at 16 organised a campaign to raise funds to rebuild schools in Afghanistan. The Founder/CEO of Twenty Four Suns, Kyleigh has been drawn to working in wartorn countries since she first traversed across a minefield in the Balkans on her 13th birthday. Her family began and operates Roots of Peace, a non-profit organization dedicated to replacing deadly minefields with bountiful farmlands - transforming the seeds of destruction with the seeds of hope. The organizations vision has been recognized by the United Nations , the U.S. State Department, former Secretaries of State Madeline Albright and Colin Powell, President Hamid Karzai of Afghanistan, President Stepan Mesic of Croatia, The First Lady of Angola Ana Paula dos Santos, The First Lady of the United States Laura Bush, Speaker of the House Nancy Pelosi, former Vice President Al Gore, Robert Redford, Sir Ben Kingsley, and many other global dignitaries in support of her quest to plant the roots of peace on earth. In her sophomore year of high school she collaborated with her mother and ABC 7 News Anchor, Cheryl Jennings, to launch an education initiative to construct schools and soccer fields for children in Afghanistan - an effort that has now built or rebuilt six schools. Kyleigh first directly encountered the culture of Afghanistan at age 18 when she visited the initial school in Mir Botcha Kot - the former frontline of the Taliban located north of Kabul. She fell in love with the bold lapis jewelry and vibrant scarves worn by the women and the intricate embroidered tunics worn by the men. As a graduate of UC Berkeley majoring in Peace and Conflict Studies, Kyleigh founded Twenty Four Suns with a clear purpose. Her vision is to engage a business model that provides a source of employment and income for the families she encountered in rural wartorn villages and share the talent and heritage of Afghanistan on a global scale. By collaborating with designers and top retailers, Twenty Four Suns seeks to support the work of the rural Afghan by engaging their resources and skills to revitalize their own communities. For more information about Roots of Peace, please visit www.rootsofpeace.org and also visit www.twentyfoursuns.com the Afghani Artisan project. Her charitable ambitions fuel her modeling career, which she uses as a podium for her humanitarian work. Philanthropy has been a great influence in her life and has guided her career as a model. "At first, the idea of being a model made me uncomfortable". In fact, Mimi Yapor, the model scout who first discovered her, has labeled her The Nonprofit Model. And certainly, before accepting the proposal from the agency that discovered her in 2008 while she was shopping in a store in San Francisco, Kyleigh Kühn waited a whole year. Instead of seizing the opportunity, as many others would have done in her place, she gave the idea careful consideration. The world of fashion had always fascinated her - she loved the eclectic style of Alexander Wang and the free spirit of his muse, Erin Wasson. Until then, however, her education and personal experiences had led to show more interest in the problems created by war, globalisation and humanitarian issues. After graduating from UC Berkeley with a degree in Peace and Conflict Studies, Kuhn signed with Next Model Management as a means to promote her nonprofit work, and she has since embraced her domain as a fashion industry spokeswoman, linking the world of nonprofit organizations with the garment industry. Today, she continues to work with the humanitarian organization founded by her mother, but she also dedicates her time to photo shoots and fashion related projects. "I came to the conclusion that modelling was an opportunity I should not waste", she admits. The Shinnyo-en Foundation has funded grants for many organizations and programs that share its culture, beliefs, and goals. Kyleigh Kuhn and her Pennies for Peace project were recipients of one of these grants. The Shinnyo-en Foundation gave the grant to Kyleigh who had created the Pennies for Peace program in which school children across America raised over $300,000 worth of pennies to remove dangerous landmines from children’s schools in Afghanistan. The Shinnyo-en Foundation fulfills a leadership role as a convener of events to create World Peace. The mission of the Foundation is “to bring forth deeper compassion among humankind, to promote greater harmony, and to plant the seeds of peace through empowerment and education of our young people in order to build caring communities." Kyleigh attributes her penchant for hard work and strength to her mother, family, and the generations of great grandmothers and grandfathers before her, who worked hard and provided solid and stable grounding to the family. “My mom raised me in a way that was very empowering to women,” she says. Her strong belief systems no doubt come from such female empowerment and a formidable home life. At the age of 13, Kyleigh traveled to the Balkans for the first time, where she met children whose lives and homes were devastated by war, and on September 11, 2011, she was reminded of the way she felt while visiting. Wanting to do something to help children in war-torn areas, she began the Penny Campaign in 2003. The initiative with Roots of Peace allows her to work closely with her mother. The Penny Campaign is now $30 million under contract in Afghanistan alone, not counting private donations. The next project Kühn is focusing on with Roots of Peace is called The World Garden Program. Its mission is to provide women and children with food by creating small farms for them to develop independently. The inequality between men and woman in Afghanistan is vast and this initiative seeks to create work for women who will be able to cultivate the food themselves and sell any excess on the market. Continuing her work in Afghanistan and bridging the gap between peace and commerce, Kühn is taking a cue from established brands such as Pamela Love and Tom’s, which capitalize on the idea of products becoming a source of fundraising. Rules for Afghan women are strict. Many are widowed and forced to send their young children out to work. Twenty Four Suns will be employing women to work from their homes, mitigating the chance of child labor. Lapis jewelry, vibrant embroidery, and rich carpets have been loves of Kuhn’s since her first trip to the country at the age of 18. “In the process of creating beautiful pieces, we will be transforming the lives of these artisans by providing them with the tools and sustainable work to lift their families out of poverty,” Kühn says. Roots of Peace, a non-profit organization dedicated to replacing deadly minefields with bountiful farmlands - transforming the seeds of destruction with the seeds of hope. 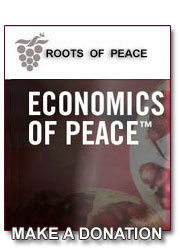 Click here to visit the Roots of Peace website and make a donation. The Shinnyo-en Foundation fulfills a leadership role as a convener of events to create World Peace. The mission of the Foundation is “to bring forth deeper compassion among humankind, to promote greater harmony, and to plant the seeds of peace through empowerment and education of our young people in order to build caring communities."